For the song, see Julbocken (song). The Yule goat's origins might go as far back as pre-Christian days. A popular theory is that the celebration of the goat is connected to worship of the Norse god Thor, who rode the sky in a chariot drawn by two goats, Tanngrisnir and Tanngnjóstr. 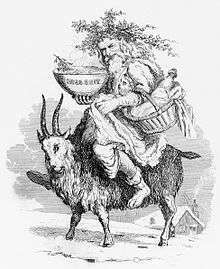 The last sheaf of grain bundled in the harvest was credited with magical properties as the spirit of the harvest and saved for the Yule celebrations, called among other things Yule goat (Julbocken). A man-sized goat figure is known from 11th-century remembrances of Childermas, where it was led by a man dressed as Saint Nicholas, symbolizing his control over the Devil. Other traditions are possibly related to the sheaf of corn called the Yule goat. In Sweden, people regarded the Yule goat as an invisible spirit that would appear some time before Christmas to make sure that the Yule preparations were done right. Objects made out of straw or roughly-hewn wood could also be called the Yule goat, and in older Scandinavian society a popular Christmas prank was to place this Yule goat in a neighbour's house without them noticing; the family successfully pranked had to get rid of it in the same way. The function of the Yule goat has differed throughout the ages. In a Scandinavian custom similar to the English tradition of wassailing, held at either Christmas or Epiphany, young men in costumes would walk between houses singing songs, enacting plays and performing pranks. This tradition is known from the 17th century and continued in places into the early 20th century. The group of Christmas characters would often include the Yule goat, a rowdy and sometimes scary creature demanding gifts. During the 19th century the Yule goat's role all over Scandinavia shifted towards becoming the giver of Christmas gifts, with one of the men in the family dressing up as the Yule goat. In this, there might be a relation to Santa Claus and the Yule goat's origin in the medieval celebrations of Saint Nicholas. 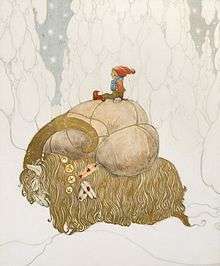 The goat was then replaced by the jultomte (Father Christmas/Santa Claus) or julenisse during the second half of the 19th century and early 20th century, although he is still called the Joulupukki (Yule goat) in Finland, and the tradition of the man-sized goat disappeared. 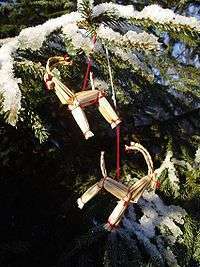 The Yule goat in Scandinavia today is best known as a Christmas ornament. This modern version of the Yule goat figure is a decorative goat made out of straw and bound with red ribbons, a popular Christmas ornament often found under or on the Christmas tree. Large versions of this ornament are frequently erected in towns and cities around Christmas time – a tradition started with the Gävle goat in the 1960s. ↑ Cf. Rossel & Elbrönd-Bek (1996:xiv). 1 2 3 4 5 Schager, Karin. Julbocken i folktro och jultradition (Yule goat in Folklore and Christmas tradition), Rabén & Sjögren, 1989. ↑ The Museum of Nordic History - Julbocksmask (Yule goat Mask) Archived June 6, 2008, at the Wayback Machine. Wikimedia Commons has media related to Yule Goat.